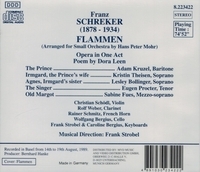 “FLAMMEN (Flames) is a one-act opera by Franz Schreker, on a libretto by Dora Leen, pseudonym of Dora Pollak (b. 23 October 1880, d. Auschwitz c.1942). Dora Pollak's father, the well-known Viennese doctor Siegmund Pollak, was personal physician to Ferdinand von Saar, an important Austrian literary figure and also Schreker's friend and mentor in Vienna. It was von Saar who arranged the meeting between the librettist and the composer. Schreker started the composition after August 1901 and completed the opera (his first) before April 1902. “Schreker was born in Monaco, the eldest son of the Bohemian Jewish court photographer Ignaz Schrecker and his wife Eleonore von Clossmann, who was a member of the Catholic aristocracy of Styria. Schreker entered the Vienna Conservatory, starting with violin studies with Sigismund Bachrich and Arnold Rosé, then he moved into the composition class of Robert Fuchs, graduating as a composer in 1900. Schreker had begun conducting in 1895, when he had founded the Verein der Musikfreunde Döbling. In 1907 he formed the Vienna Philharmonic Chorus, which he conducted until 1920: among its many premières were Zemlinsky's ‘Psalm XXII’ and Schönberg's FRIEDE AUF ERDEN and GURRE-LIEDER. 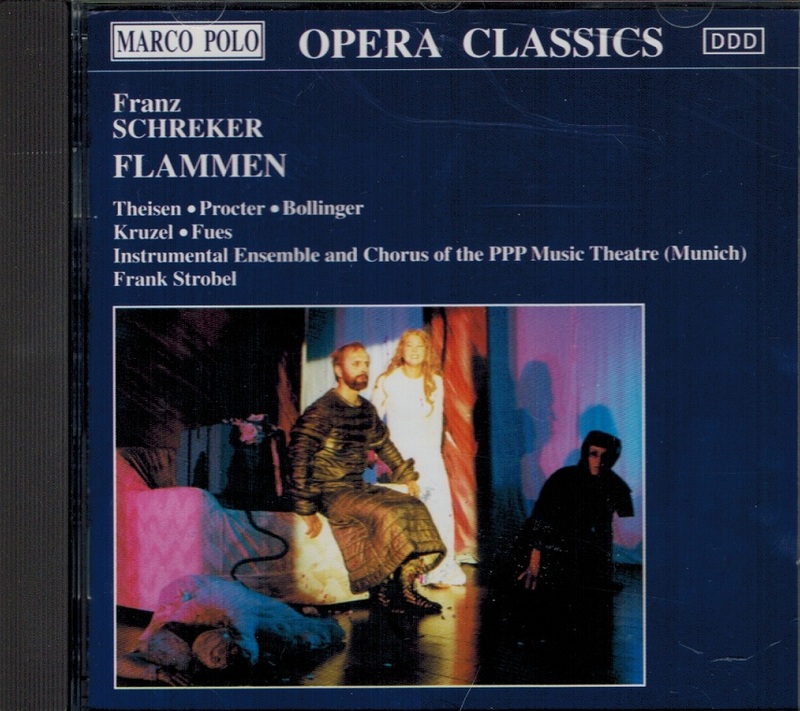 November 1909 saw the stormy premiere of the complex orchestral interlude (entitled ‘Nachtstück’) from DER FERNE KLANG, the opera he had been working on since 1903. In 1912, the first performance of the complete opera in Frankfurt consolidated his fame. His next opera, DAS SPIELWERK UND DIE PRINZESSIN, which was given simultaneous premières in Frankfurt and Vienna (15 March, 1913) was less well received (the work was subsequently revised as a one-act 'Mysterium' entitled simply DAS SPIELWERK IN 1915), but the scandal caused by this opera in Vienna only served to make Schreker's name more widely known. The outbreak of World War I interrupted the composer's success but with the première of his opera DIE GEZEICHNETEN (Frankfurt, 25 April, 1918) Schreker moved to the front ranks of contemporary opera composers. The first performance of DER SCHATZGRÄBER (Frankfurt, 21 January, 1920) was the high point of his career. The Chamber Symphony, composed between the two operas for the faculty of the Vienna Academy in 1916, quickly entered the repertoire and remains Schreker's most frequently performed work today. In March 1920 he was appointed director of the Hochschule für Musik in Berlin and between 1920 and 1932 he gave extensive musical tuition in a variety of subjects with Berthold Goldschmidt, Alois Hába, Jascha Horenstein, Julius Bürger, Ernst Krenek, Artur Rodzinski, Stefan Wolpe, Zdenka Ticharich and Grete von Zieritz numbering among his students. 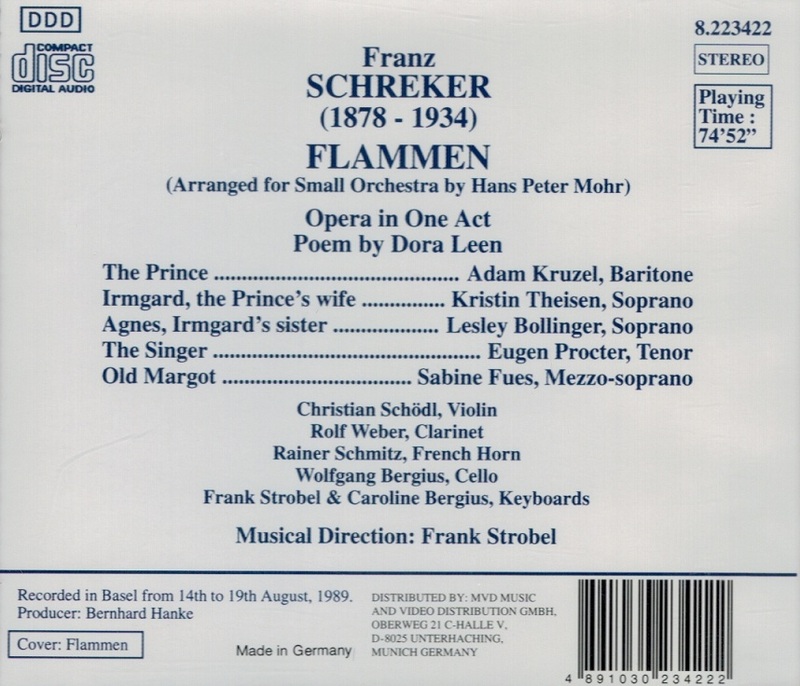 Schreker's fame and influence were at their peak during the early years of the Weimar Republic when he was the most performed living opera composer after Richard Strauss. The decline of his artistic fortunes began with the mixed reception given to IRRELOHE (Cologne, 1924 under Otto Klemperer) and the failure of DER SINGENDE TEUFEL (Berlin, 1928 under Erich Kleiber). Political developments and the spread of anti-Semitism were also contributory factors, both of which heralded the end of Schreker's career. Right-wing demonstrations marred the première of DER SCHMIED VON GENT (Berlin, 1932) and National Socialist pressure forced the cancellation of the scheduled Freiburg première of CHRISTOPHORUS in 1933 (the work was finally performed there in 1978). Finally, in June 1932, Schreker lost his position as Director of the Musikhochschule in Berlin and, the following year, also his post as professor of composition at the Akademie der Künste. In his lifetime he went from being hailed as the future of German opera to being considered irrelevant as a composer and marginalized as an educator. After suffering from a stroke in December 1933, he died in Berlin on 21 March, 1934, two days before his 56th birthday.